Present your work at the 2016 eucen Autumn Seminar! Remember you can present your work during the Poster Session at eucen's upcoming Autumn Seminar on Digitalisation in university continuing education: Technology, content and pedagogy (Barcelona 24-25 November 2016). Link to the website. Digitalisation in UCE/ULLL - Full programme available! The full programme for the 2016 eucen Autumn Seminar is now available following this link. You will see names like Albert Sangra, Antonio Teixeira or Ebba Ossiannilsson. Follow the link to see the full list! 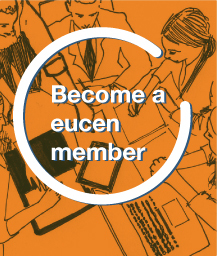 The second eucen newsletter in 2016 is out now! It gives you some details about the successful Dublin conference, eucen's 25th anniversary and other activities done since the last issue.